I know the basics. Now what? Your web site helped me a lot up to this point but to be honest I’m stuck now. I know basic electronics concepts but cannot understand how to connect the parts and control a motor for instance. I cannot even create a schematic for a circuit more complex than a circuit for using a switch to on and off a LED. I’m following your website, learning new thing each day but somehow I’m stuck at this point. I know what a resistor is, I know what a capacitor, transistor etc. but I cannot combine them and create a meaningful circuit that serves for a specific purpose..
How can I practice about this specific issue? I like your eagerness to learn this. If you keep at it you’ll definitely learn it! Here’s a tip: Don’t try to figure out how to design something from scratch at this point. Start by looking at what others have designed first, and build these circuits. It’s like when you want to learn to cook, it’s much better to start with recipes that others have made before you try creating your own recipes from scratch. 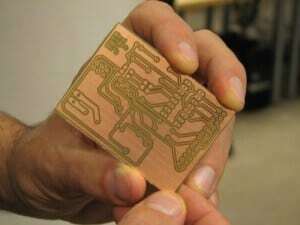 When you have built a few circuits and you’re able to understand how they work, then you can start improving on these circuits on your own. And with time, you’ll be able to design circuits by heart. If your goal is to control a DC motor, start by looking at DC motor control circuits that other people have designed. If you have more questions, let me know and I’ll do my best to point you in the right direction.